If we have a sentimental view of the fire of God’s love but we experience His fire as Jesus preached it, then it has the potential of confusing us and throwing our spiritual lives into a tailspin. “Man I thought the Christian life was to make me feel good and all I seem to be getting is heat. What am I doing wrong?” It is a problem when we sing of one thing but experience another. Instead of wanting to sing Pass It On we sing that old song from Hee Haw. I have noticed a shift in our way of thinking as evidenced from how we pray. We do not accept this perspective of Hebrews today. Listen to this prayer from an old manual for priests. This is what a priest used to pray over his parishioner. However the prayers for the sick in the 1979 Book of Common Prayer tend to tip toe around the idea that God may use our sickness to chasten us. Instead focus more on relief of pain and restoration of health. We are not comfortable today talking about the fire of God but if we do not then we end up with an imbalanced understanding of the ways of God. And the serious problem with that is it potentially opens the door for the accuser of the brethren to enter and attack our faith and destroy our hope. Please understand. I want to be very clear here. I am NOT saying that all sickness is God’s discipline of us. No matter what kind of saint you are, in a fallen world, you’re going to get the flu sooner or later and that is not necessarily the direct hand of God. And I also am pretty safe in believing that unless the Lord returns we all are going to die of something. Nevertheless we must be open to the reality that when trials come our way, they could be coming because the Lord has allowed them and He allows them because He loves us and wants to discipline us. The truth is that some of our most important spiritual growth comes when it seems like all hell is breaking lose and not when things are going wonderfully. When I was living in Chattanooga, before entering the priesthood, I was a caseworker at a shelter for teens. One day I was doing an intake on a teenage girl and I asked her how she came to the shelter. She told me that she had run away from home. When I asked her why she had run away she said that she ran away because her parents don’t love her. I said, “How do you know that they don’t love you?” She said, “Because they let me do anything I want.” I thought that was pretty profound insight on her behalf and this is exactly why God disciplines us. He doesn’t let us do whatever we want because He loves us too much. but both are true. And so while it may not be the kind of news that we want to hear, the good news is when we are experiencing the fire, we are experiencing God. And what is interesting about God being a consuming fire it that the effect of His fire is different depending upon who we are. The note on verse 49 in the NLT Study Bible says, “Jesus’ ministry radically changed the status quo, bringing judgment on the wicked and purifying the righteous.” (p.1734). Did you get that? For some it brings judgment while for others it is for purification. This put me in mind of the passage in Corinthians that speaks of our good works being tested by fire. If our good works are focused on the world, and therefore are of wood, hay and stubble, then they will be burned up. But if our good works are focused on the kingdom, and are therefore gold, silver and precious stones, then they will pass through the fire and we will be rewarded. So the SAME fire for some results in destruction while for others it leads to rewards. What is so very humbling about this fire is that for Jesus it was for judgment and not for purification. Why do I say that? First, there was nothing from which Jesus needed purification. He was without sin. But second, there was plenty for which we needed to be judged. And so He took OUR judgment upon Himself. “He who was without sin became sin for us that we might become the righteousness of God.” (2 Cor 5:21). That is why Jesus said “I have a baptism with which to be baptized, and what stress I am under until it is completed.” That is what we are saying in the “comfortable words” of the 1928 Mass when the priest declares that Jesus Christ is the Propitiation for our sins. He took God’s wrath against sin, so that we don’t have to. How does the purifying fire come? One way we heard in our Old Testament Lesson. “Is not my word like fire, says the LORD, and like a hammer that breaks the rock in pieces?” God’s word is God’s fire. You will recall that after Jesus was resurrected when He spoke with some disciples on the road to Emmaus afterwards they said, “Did not our hearts burn within us while he talked to us on the road, while he opened to us the Scriptures?” Scriptures are God’s purifying fire to our souls. They convict us where we are doing wrong. They light the way, showing us where we are to walk. By declaring God’s unchangeable truth they also create a fire that divides one side from the other. As Jesus said, son against father, mother against daughter, mother in law/daughter in law. I have family members who are not walking by the light of God’s Word. It grieves me deeply and I love them dearly, but I cannot compromise the truth to try to heal the division. The reality is that we are divided from one another on the most important topic of life. All I know to do is to pray for them daily to one day walk in the light. Those of us reading the One Year Bible are in Nehemiah now. It is a great story, how through the leadership of Ezra, the people of God return to the Scriptures and purify their lives of idols and idolatrous living. The surprising part of the story is that they have not heard the Scriptures for generations. So when they finally hear them they are so convicted that they weep and tear their clothes. But instead Nehemiah and Ezra call for a festival to rejoice in the renewal brought about by the cleansing fire of God’s Word. I was sitting in my office thinking, “How in the world can an entire generation lose God’s Word?” Then I recalled some statistics that I have read about our generation. 50% of Americans cannot name ANY of the 4 Gospels. Over 1/3rd of Americans read the Bible LESS than once a year. 60% of Americans cannot name 5 of the 10 Commandments and 50% of High School Seniors think that Sodom was married to Gomorrah. (http://www.demossnewspond.com/americanbible/press_kit/bible_statistics) Why would we think, that if we keep going in this direction, that we would be different from all of the other nations before us who have rejected the purifying fire of God’s Word? When we reject purification, we invite judgment. Another way God’s fire comes to us is through the ministry of the Holy Spirit. John told his disciples that Jesus would baptize them with the Holy Spirit and with fire. Jesus said when the Spirit comes that He will convict the world of sin and righteousness and judgment. (Jn 16:8). This role of the Spirit is why blaspheme against Him is such a horrible thing. It is the unforgivable sin because if you refuse to be convicted of sin and righteousness and coming judgment then how will you ever repent? How will you atone for your sins? Only the Holy Spirit can turn a heart of stone into a heart of flesh. Only He can takes our sins, which are like scarlet, and wash us whiter than snow. It has been my experience that the Holy Spirit is a gentle kind of fire. While He is Lord, He does not lord over us like an oppressive master. He convicts, He does not condemn. He guides, He does not drive. He creates awe but He casts out fear. Still we must not confuse His gentleness with ambivalence about our sin. We are His temple and He requires His temple to be a holy place. It has also been my experience that when I quench or grieve or ignore the purifying fire of the Holy Spirit that I end up in places that I should not be. I end up in places where I invite God’s discipline and I have no one else to blame but me. it NEVER and I mean NEVER works out well for them, does it parents? What do you do as a parent? You don’t stop loving them but you take measures to make your message a little clearer. Many of us grew up with the board of knowledge being applied to the seat of learning. That may not be your way but you get my point. God disciplines us as we do our kids and in both cases it is because of love. Therefore it is important for us to cultivate a habit of listening to the Holy Spirit when He guides or convicts or corrects us. Since He inspired the Scriptures we learn His voice best by reading the Scriptures. Then when He speaks to us in other ways we will recognize His voice. And then we do what He tells us to do because we don’t want to be the kind of stubborn children that continually invite correction. in our life. In other words we are to look for His purpose in them and this makes them bearable. As I said about sickness, I don’t think that we have to see all of life’s trials as being sent directly by God to discipline us. But what we can do is look for life’s trials to be used by God for our good. We read in Romans that not some things but that ALL things work together for good for those who love God and are called according to His purpose (Rom 8:28). This may be simplistic but I have found over the years that when we are faced with difficulty we have one of two roads before us. We can become bitter or we can become better. Which way we go has a lot to do with whether or not we see God in it. If you are not a believer then you look to luck or the stars or karma and easily become cynical. But if you are a child of God then you look for the hand of your Father and know that behind it all is His love. 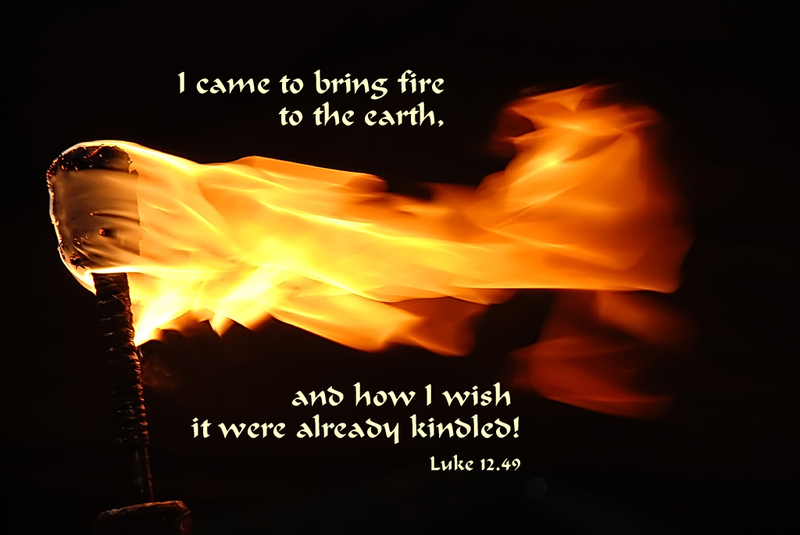 To prepare us to hear those words Jesus comes to us with fire. He comes not with a sentimental warming fire but a consuming fire that purifies. That is not easy to hear but it is what He said. So instead of being afraid of His words, we need to say, “Blessed is He who comes in the Name of the Lord.” Amen. As always a very inspiring message. Thanks for letting God use you to speak to me. My wife and I visited St. Patrick’s for the 9am service this past Sunday. We intend on coming back fo the 11am service next.